Want to learn more about RNA therapeutics and their potential to treat cancer? Explore how miRNases can target lyphosarcoma cells with Elena Bichenkova from Manchester University. She will discuss how novel peptide-olognucleotide biconjugates can silence miR-21 in lymphosarcoma cells as a potential intervention for cancer and how intelligent ant-cancer therapeutics are being developed against oncogenic microRNAs. 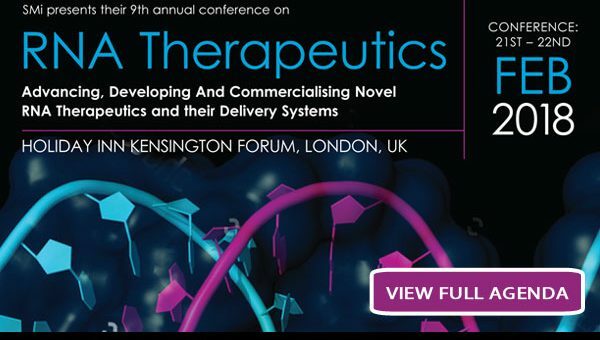 Elena will also present key challenges in the traditional drug discovery and development (DDD) process, where she will highlight some emerging opportunities in attempt to overcome the key issues. You can also discover opportunities and challenges of developing microRNA based oligonucleotide therapeutics with Ekkehard Leberer. He will illustrate the generation of an anti-fibrotic oligonucleotide drug targeting microRNA-21, which has been implicated in multiple organs with fibrosis and cancer. Ekkehard will also present, how MicroRNAs regulate by the mechanism of RNA interference (RNAi) biochemical pathways involved in human diseases.